Although only one giraffe species exists (Giraffa camelopardalis), there are a whopping nine separate subspecies under that umbrella. The Masai giraffe (Giraffa camelopardalis tippelskirchi) and the reticulated giraffe (Giraffa camelopardalis reticulata) are two of them. These two subspecies are close in many ways, but also possess marked differences. 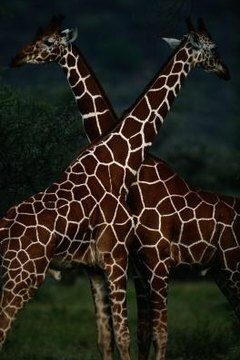 One prominent difference between the Masai and reticulated subspecies of giraffes involves size. Out of the many subspecies, Masai giraffes are the biggest, states the Pittsburgh Zoo. Male Masai giraffes are taller than the fairer gender, and usually grow to heights of around 18 feet. For females, the average is closer to 14 feet. Male reticulated giraffes usually attain heights of between 15 and 17 feet, indicates the Sacramento Zoo, while the reticulated females are very similar to Masai females height wise -- think 13 to 15 feet. When it comes to giraffes, apart from their uber-long necks, their spots are some of their most noteworthy features. The spots on Masai and reticulated giraffes are vastly different. Masai giraffes have rather unpredictable, very deep brown spots that closely resemble oak leaves, according to the Nashville Zoo. These ragged spots are a major contrast to those of reticulated giraffes, which are slightly lighter brown in color and shaped very similarly to polygons -- with straight, smooth sides. Because of the difference in spotting, telling a Masai giraffe apart from a reticulated giraffe standing side by side would be quite an easy task. Masai giraffes are native to the eastern region of Africa -- both Tanzania and Kenya. Reticulated giraffes are native to Kenya as well, but also to Ethiopia and Somalia. Masai giraffes inhabit savannas and woodlands, and reticulated giraffes live in very similar environments. Reticulated giraffes are often found in areas that have sprinklings of acacia trees throughout the landscape. One great difference between Masai and reticulated giraffes involves population. Numbers wise, many more Masai giraffes exist compared to reticulated giraffes, according to the International Union for Conservation of Nature's Red List of Threatened Species. Up to 40,000 individual Masai giraffes freely roam throughout their natural range, compared with the estimated figure for reticulated giraffes -- no more than 5,000 in total.